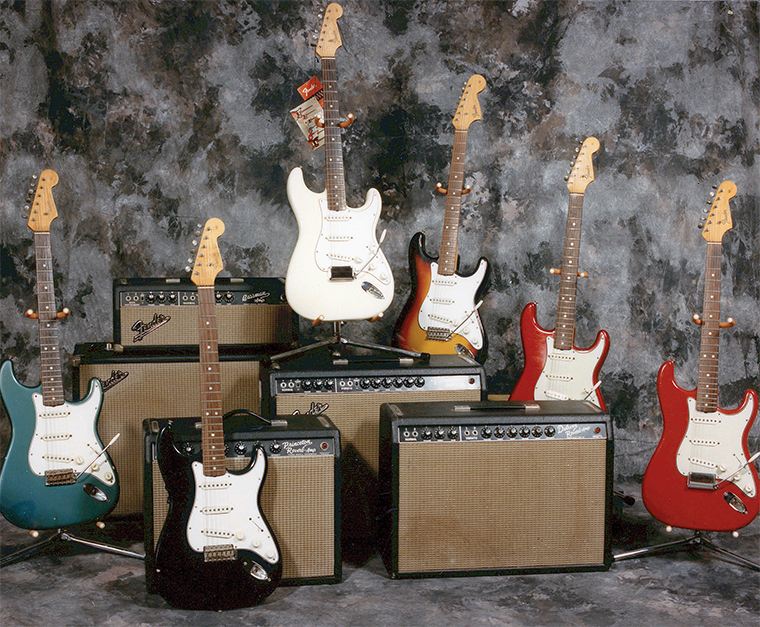 In 1953, Leo Fender started planning a new standard guitar – the Stratocaster. His partner, Don Randall, who headed Fender Sales, Inc., came up with the name before the design was even completed. Of course, the new Fender would compete with Gibson and Epiphone professional models. But Leo intended even more. He believed his continued success meant making the Telecaster obsolete before someone else did. He trusted the essence of its design – the screw-on neck and solid body. But in the inventor’s mind, other details such as the bridge, body shape, and pickups needed refinement. All those would be improved on the Stratocaster. Moreover, Leo would add a built-in vibrato system, a direct challenge to cross-town rival Paul Bigsby. Just as Homo Sapiens were the new, improved version of Homo Erectus, the Strat represented an evolutionary step in the Fender guitar, a new super model. To Leo, the audacious inventor, his new guitar was the design to end all designs. A 1954 Stratocaster, the year the model was “launched” by Fender. Photos: Michael Tamborrino/VG Archive. Freddie Tavares, hired by Fender in ’53, remembered his first assignment with Leo was drawing different renditions of the Strat. Together they sketched lines for the body using the Precision Bass as a model, making many false starts and corrections. Leo had arrived at the bass’ profile through much trial and error, achieving the right balance by creating the body horns. Deep cutaways made the upper frets more accessible and reduced an instrument’s weight. Bill Carson, who was at the factory regularly during these weeks and tested the first prototype when it was ready, remembered Leo making several different versions of cutaways for the Strat body. Yet Freddie always maintained that the guitar’s outline came from the first drawings he and Leo made, not from experiments on wood. By the time Leo built the first prototype, he had decided on the degree of cutaway. In addition to deep cutaways, the Strat had what Leo called “contours,” a scooped-out cut on the back and a smooth bevel on the front under the player’s arm. These sculptured areas allowed a snug fit to the player’s body and had been suggested by guitarist Rex Gallion. Tavares remembered Rex saying to Leo that a solidbody did not require an acoustic sound chamber and therefore did not require a squared-off body. He implored Leo, “Why not get away from a body that is always digging into your ribs?” Leo probably made bodies with different contours to test (and over the years the contours varied from deep to shallow). The Strat’s contoured and deep-cutaway body gave the guitar its streamlined, modern appearance, but its hallmark was the built-in vibrato. Its shimmering steel-guitar-like effects were achieved in a way that minimized tuning problems associated with older units like the Kauffman Vibrola. The fresh vibrato came with a new-fashioned bridge. Fender, again seeking to outdo other designers, made each section adjustable for length and height. The prototype tested by Carson had intonation screws that adjusted from the pickup side—opposite that of later production models. While the fully adjustable six-piece bridge came more as a result of the Telecaster bridge’s inadequacies, Leo’s new bridge was also a response to the Melita bridge used on Gretsch guitars, the Valco design licensed for use on Gibson guitars (but rarely seen), and Gibson’s own Tune-O-Matic. ’66 Strat in Ice Blue. Leo also wanted to put better pickups on the Stratocaster. In his evaluation, the Tele’s worst problems started here. The low E string often sounded louder than the others. Indeed, incredulous customers returned early Teles to the factory because of the inequity. Some had another pickup problem – screeching microphonic feedback when held too close to the amp at high volume. Fender tested a variety of pickup designs, including coils of varying heights, widths, and impedance. He also tested polepieces with different lengths and diameters, both critical variables in the way a pickup sounded. No one remembers all these trial-and-error combinations, and unfortunately, Leo made only mental notes of his efforts. However, Fender’s 1953 inventory sheets list 117 Stratocaster elevator plates, hints of a discarded pickup design. Apparently, he discovered that elevator plates and metal covers contributed to the Tele’s feedback, so he did not use them on production Strat pickups. Unlike the earlier Tele pickups, the Strat’s used staggered polepieces that varied in height to accommodate differing string gauge outputs. Leo Fender’s puttering with pickups resembled art, not science. Still, in the ’50s he accomplished a great deal with his imprecise means. The Strat’s three pickups retained a clear, biting, yet musical tone similar to the Tele’s. The oddball way Fender explained his decision to use three had little to do with music: he had plenty of three-position switches in stock, so he used three pickups (of course, Gibson had introduced the triple-pickup ES-5 in ’49). Obviously, Leo also found that three pickups worked quite well, but he could not foresee which tones players would like so much. By design, the stock Strat switch circuit allowed only three of at least seven possible pickup combinations. Leo liked the pure sound of individual pickups; the middle pickup and the rhythm pickup each had a tone control while the treble-strong lead pickup had none so it would sound more like a steel guitar. Inspired by the sound of the Islands, Fender wanted to put the steel guitar’s tone and sustain into his solidbody standard guitars. Musicians with other ideas quickly discovered quirks inadvertently built into the switch that opened even more sonic possibilities. By carefully positioning the lever between settings, signals from two pickups mixed, producing snarling nasal tones, which literally redefined electric guitar sound. The tones were reminiscent of a muted trumpet or trombone, but with the snap and sting of downed power lines. Two so-called half-switch combinations existed: the front with the middle pickup, and the lead with the middle pickup. Over the years some players believed the pickups were electronically out of phase, but it was their unique positioning under the strings that caused the chaos of overtones in the half-switch position. Fortuitously, that chaos blended to become something splendidly euphonic. Ironically, Leo never intended the Stratocaster to produce its most popular tones. A trio of early-’60s Olympic White Strats. From left, a ’63 a ’65, and a ’62. Fender liked the way the Stratocaster went together at the factory. The pickups and controls were mounted onto the pickguard and attached as one unit to the guitar’s face. When the time came to join the Stratocaster body to its electronics, the workers simply attached the pickguard assembly to the body with screws, grounded it to the vibrato, and connected the jack. But Leo quickly learned a major lesson about guitar design: fixing one problem often created another. Although the factory could easily manufacture the Stratocaster pickup assemblies, players found the guitars difficult to service without loosening the strings. The vibrato made loosening, changing, and re-tuning strings difficult. Moreover, the truss rod nut could not be turned with the pickguard in place. On the plus side, the pickguard echoed the shape of the guitar’s body, thus enhancing the Strat’s visual impact. The Strat’s curves, cutaways, headstock, pickups, and sleek tremolo arm all had flair. Amazingly, Leo squeezed a little more practicality and style into the design with the jack plate. He had placed the Tele’s jack plate on the bottom side, out of the player’s view. As a result, players sometimes fumbled with it and tripped on the cord, which hung straight down. Of course, this placement worked, but Leo sought to improve everything. George Fullerton suggested slanting the jack and mounting it on the guitar’s face. Most players found the position convenient. The Strat was one of the guitars most frequently ordered in custom colors. Several times Leo insisted that he had the guitar ready to manufacture in mid ’53, implying that all the necessary parts were ready to go. However, detailed inventory sheets from December ’53 show no Stratocaster decals, much less bodies, necks, or pickguards. 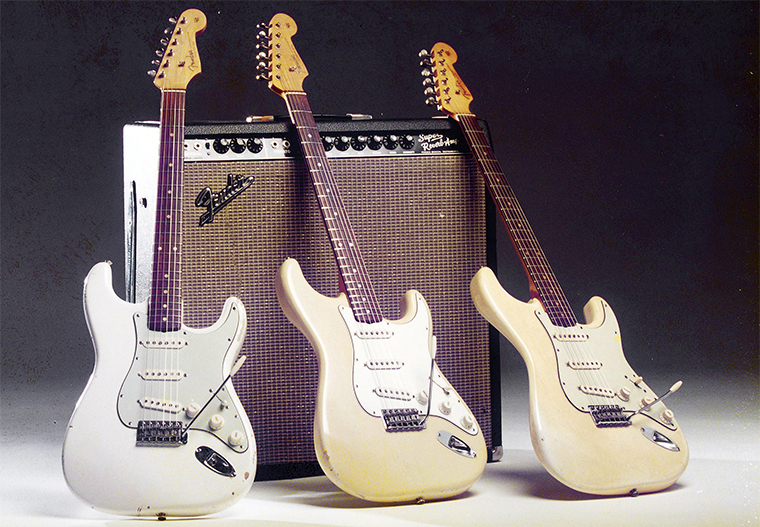 In a letter to dealers, Randall promised to deliver the first Strats on May 15, 1954, and an early pre-production run – albeit a small one – started in April. Today, some of this early history sounds ludicrous when viewed out of context. Building a guitar to make the black-pickguard Tele obsolete? Inventing a vibrato that would take Bigsby to the cleaners? 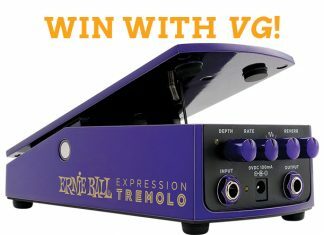 Challenging the best acoustic/electric jazzboxes Gibson and Epiphone could offer? Still, those were the goals. Leo Fender, the audacious inventor, aimed high. And for that reason, from the outset the Strat was destined for guitar greatness. Indeed, from a commercial standpoint, it is the most successful electric guitar design in history. Perhaps this is an understatement, but the Strat is certainly a worthy member of the VG Hall of Fame. The Strat’s hallmark was its vibrato, which minimized tuning problems associated with previous units. 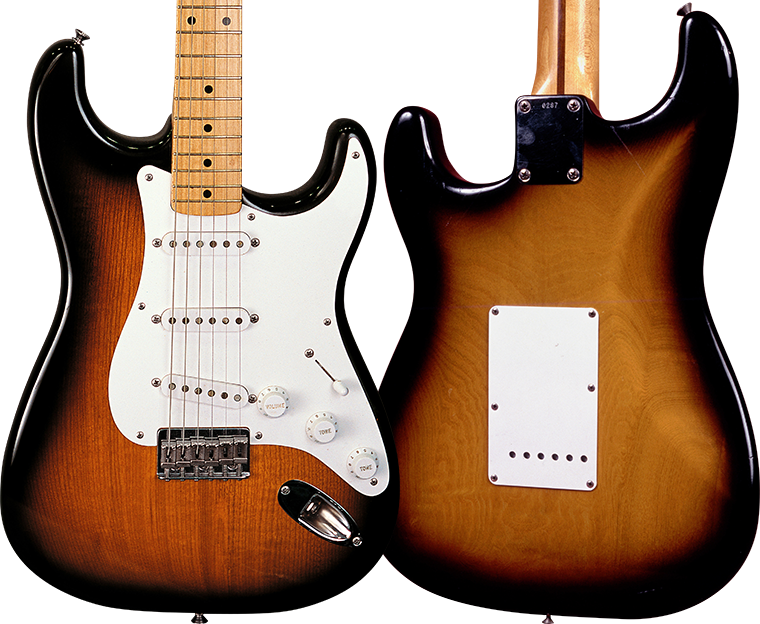 Leo Fender tested a variety of pickup designs, including polepieces of different lengths and diameters; ultimately, he opted for staggered poles that varied in height. (RIGHT) The Strat’s “contours” were designed for greater player comfort. This article originally appeared in VG June 2000 issue. All copyrights are by the author and Vintage Guitar magazine. Unauthorized replication or use is strictly prohibited.